We provide diplomatic security services to anyone in the public eye, including family members, partners, assistants and other companions. We perform advance work, detailed intelligence gathering and deploy the most experienced of specialized diplomatic security professionals. Close protection for diplomats is implemented in public and private settings, whether stationary or in transit. A primary focus is planning routes, advance rooms sweeps in buildings where our diplomatic client will be visiting, researching the background of people that will have contact with the client, searching vehicles, and attentively escorting the client on their day-to-day activities. Our core belief is that the best security is based upon advanced planning and preparedness, working with local law enforcement and getting the most accurate real-time information available. Our company and staff have years of experience guarding diplomats, executives, celebrities and VIPs – with a stellar track record. Our bodyguard’s qualifications and credentials demonstrate both specialized training in related military applications and law enforcement. 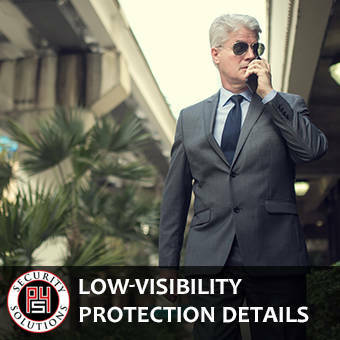 We work seamlessly in the background, we are always present and we blend in with every event and situation, matching ourselves to the specific styles, needs and schedule of the person or group that we are protecting. P4 Security Solutions capabilities were developed to exceed our clients’ expectations by securing intellectual property and human assets. Our experience in any category of diplomatic security services is unparalleled. We maintain a team of subject matter experts with accessibility to cutting edge tactics and resources, providing either full-scale security management or seamlessly working alongside your existing security team. If you have been thinking about whether you need protection services or have an upcoming situation or event, please call us all at (773) 595-6690 or use the online Request Consultation form for more information.